How Much Can You Make in a Paralegal Career? What Courses Can be Taken for an Online Paralegal Degree? Paralegals assist lawyers by drafting correspondence and case documents, conducting legal research, and maintaining and organizing files. Some paralegals work closely with lawyers from the beginning to the end of a case, while others — especially those employed in large law firms — handle only specific aspects of legal work such as collecting evidence for hearings or writing final settlement agreements. Several schools offer paralegal certificates online and on campus, thus opening the field for both traditional and nontraditional students. The Bureau of Labor Statistics (BLS) projects 15% growth for jobs in this field, faster than the average projected rate of 7% for jobs in other fields. Paralegals, whether they complete an online or on-campus program, can expect a healthy job market when they graduate. This guide explores the different aspects of earning a certificate or bachelor’s in paralegal studies, including coursework, career options, and financial aid and scholarships. *PBV is a proprietary metric that compares the cost of a program to the cost of other programs with the same (or a similar) qualitative score. It also compares the qualitative score of the program to the score of other programs with the same (or similar) cost. In short, the PBV calculation denotes the overall value – or “bang for your buck” – of an online degree..
To determine our list of top-ranked online bachelor’s degrees in paralegal studies, we examined cost, specialization areas, and graduation rates. While you’ll want to consider program cost when choosing a school, also keep in mind internship opportunities and coursework variety. Schools that appear in the list below offer programs designed to assist paralegal students in launching their careers or in preparing them for further studies in the field. Hampton University is a private university that offers entirely online degrees, including a Bachelor of Arts in Paralegal Studies. This 4-year program is designed for both existing paralegals and those who are interested in entering the field. While many graduates go on to begin a career as a paralegal, some graduates choose to continue their education with law school. The curriculum for the bachelor's degree doesn't allow students to specialize, although there are plenty of elective options to give students more exposure to areas of the law that they're interested in. In total, students will need to complete 122 credit hours with a minimum of a 2.5 GPA in major courses and a 2.0 GPA in all other courses. Transfer students need to have a minimum GPA of 2.5 for all credits they want to bring in. Because the program is designed for new paralegals or current paralegals, Hampton accepts work experience for school credit. Because Hampton is a private school, students are charged the same per-credit tuition rate regardless of their location. Military students are charged an even lower tuition rate. While earning their degree, students have access to career development services, and Hampton also offers a variety of undergraduate certificates that can be combined with the BA in Paralegal Studies for students who are interested in more niche fields. Students are assigned an academic adviser that helps them craft the best curriculum for the fields they are interested in entering. William Woods University offers 2 options for completing the Bachelor of Science in Paralegal Studies: and entirely online 4-year program or the online transfer degree completion program. Both of these lead to the same degree, although the time it takes to complete the program and the prerequisites differs. The paralegal studies program requires a minimum of 42 credits, all of which are offered online. Transfer students may be able to satisfy some of these credits through transferring, but the majority needs to be completed through William Woods University. Internships aren't required for the program, but students will still gain paralegal experience through the coursework. Courses are offered in accelerated 8-week periods, allowing the full program to be completed in less than the expected 4 years. Start dates occur at 6 points throughout the year. The time it takes transfer students to complete the program depends on how many credits they bring in, and a minimum of 25 transferrable credits or an associate degree is required to be accepted into the transfer program. To apply, high school students need a 2.5 GPA or better on their high school transcripts or GED. Also, a minimum ACT score of 19 or SAT score of 900 is required. Both programs are members of the American Association for Paralegal Education, and while examination isn't required to complete the degree, students will be prepared to take paralegal exams. At Liberty University, online learners can complete a Bachelor of Science in Paralegal Studies entirely online with no on-campus obligations. This 120-credit degree takes most full-time students approximately 3.5 years to complete. In this program, you will develop strong professional skills and a foundation in law, politics and government. The curriculum includes an exploration of case studies and experimental learning assignments. You will also learn how to be part of a professional team and work closely with supporting attorneys at law. Liberty faculty members are previous private practice partners, lawyers and certified public accountants. They provide online learners with a comprehensive, experience-based education that will help you take on paralegal duties in virtually any legal or administrative setting. Applicants must have a 2.0 GPA or higher for admission in good standing. Prospective students with lower GPAs may be considered for probationary admission. Your ACT or SAT scores are required for admission if you are under 22 years old. Prospective bachelor's degree students also must submit a high school self-certification form, a personal essay and mail in official transcripts. Students with lower than average test scores or GPA may submit supplemental letters of recommendation. Incoming students may transfer up to 90 credits toward this bachelor's degree. Online students with military training or service experience may be eligible for a significant tuition discount, provided they submit all corresponding documentation. Liberty also offers the Heroes Fund Scholarship. Wounded veterans and spouses of veterans killed in action may apply. Liberty has rolling admissions, so there is no hard deadline for applications. They do have a "priority deadline" of January 31 for the fall semester, and November 1 for the spring. Apply by those dates to increase your chances of being admitted. Founded in 1991, Florida Gulf Coast University has grown a significant amount in a short period of time. One reason for this is because the tuition rate has remained the same for the past 4 years and there are no plans to increase it. Another reason is because of its distance education programs. The Bachelor of Science in Legal Studies is FGCU's entirely online option for students interested in paralegal studies. Upon completing this degree, students will be eligible to take the Certified Legal Assistant's Exam, which is required to gain licensure in some states. To graduate, students need to have a cumulative GPA of 2.0 or higher and need to complete 120 credits, 48 of which need to be upper division classes. Only 39 credits are required for the Legal Studies degree, roughly half of which are elective courses. While there are no specific concentrations available for the program, students can take these elective courses to add a focus to their degree. Also, while all of the courses for this program can be completed online, students are required to attend an orientation session after being accepted into the program. This may mean that students will need to visit campus for a short period to complete orientation. Earning your paralegal bachelor’s degree online or on campus opens up several career opportunities. A degree can also enhance your earning potential, although it by no means guarantees a higher paycheck upon graduation. A bachelor’s degree in paralegal studies assures prospective employers you have the knowledge, training, and skills to carry out the various responsibilities that come with the position. As stated above, BLS projects a robust job growth for this field and having a bachelor’s degree gives you a competitive edge in vying and qualifying for these jobs. The table below lists job growth and salary expectations for five common occupations open to paralegal graduates. Corporate paralegals typically help lawyers in preparing employee contracts, annual financial reports, and shareholder agreements. Litigation paralegals are often more involved in courtroom logistics such as setting up exhibits, organizing evidence and other documents, and taking depositions. Both types of paralegals are often expected to be adept in using technology and various computer software to organize and maintain different types of digital files and documents. Arbitrators, mediators, and conciliators work outside the court system to help settle disputes between opposing parties. They facilitate communication, clarify concerns and issues, conduct one-on-one and joint meetings with disputants, and prepare settlement agreements. In addition to mediation, they often evaluate employment records and physician reports, and apply the regulations and policies relevant to the dispute. Several industries employ claims adjusters, appraisers, examiners, and investigators, who investigate claims to ensure their authenticity, confer with legal advisers when necessary, contact concerned parties to verify information, and negotiate settlements. They can work for insurance companies or individuals, as well as for private lawyers or the courts. Paralegals can work as legal secretaries or administrative assistants and put their knowledge of legal terminology and procedures to good use. They usually assist in the preparation of different types of documents (motions, summonses, subpoenas) and can help with research and even with drafting legal briefs with appropriate guidance and supervision. Court reporters create verbatim transcripts of legal proceedings and provide copies of these transcripts to all stakeholders when requested. They operate specialized apparatus (stenography machines, audio and video recording equipment) to capture speech and they also note a speaker’s gestures and facial expressions or mannerisms. Court reporters index documents and catalog exhibits used in a courtroom trial. The mean annual wage for paralegals and legal assistants ranges from $35,010 to $46,490 in New Mexico, Montana, and Kentucky, and from $55,360 to $78,350 in New York, Illinois, and California. Alaska, Connecticut, New Jersey, Washington, and the District of Columbia pay the highest salaries for paralegals, while the New York-New Jersey metropolitan area employs the highest number of professionals in this field. Being aware of the impact of job location on your income potential can help you decide where you choose to build your career. Coursework for on-campus and online bachelor’s degrees in paralegal studies vary greatly between schools and areas of specialization. In general, paralegal programs offer courses in legal research and writing, litigation, court procedure, and the U.S. legal system. Most schools publish course offerings as well as core requirements, electives, and graduation prerequisites on their websites. Most paralegal programs offer the following courses. If you have specific questions regarding class schedule or course availability, contact the school directly. Students learn about foundations of the American legal system, regulatory issues, civil litigation, and the U.S. Constitution. They develop reasoning skills to fulfill paralegal responsibilities in different areas of legal practice. This course introduces paralegals to emerging ethical issues and concerns in the practice of law, which may include client-attorney confidentiality, digital privacy, and conflicts of interest. Aspiring paralegals study the procedural rules that govern civil litigation in state and federal courts. They also learn how to conduct client interviews and perform pre-litigation investigation. This course focuses on the role of paralegals in personal injury litigation and provides a foundation in the area of civil tort liability. Students also learn how to draft pleadings and conduct pretrial interviews. Course enrollees study principles of estate and trust administration, state probate laws, asset valuation, and probate court procedure. This helps them prepare the legal documents required for estate administration. Several factors affect the quality of an online paralegal program: accreditation, areas of specialization, cost, and available coursework. In addition, personal factors come into play, depending on your particular situation. Because of these variables, no single online paralegal program will suit everyone. This section explores common questions students ask about online paralegal programs. Does an online paralegal program offer the same courses as an on-campus program? Most schools offer the same coursework for their online and on-campus paralegal programs. However, the schedule of classes may differ, especially if you are enrolled in asynchronous courses. Synchronous classes follow the schedule of on-campus classes, so you will be taught by the same professors and will cover the same subject matter as on-campus enrollees. How long does it take to graduate from an online paralegal bachelor’s program? Like other typical bachelor’s programs, an online paralegal bachelor’s program has 120-122 credits and usually takes four years of full-time study to complete. However, some online programs have several intake periods throughout a school year. This often means you can enroll in more credits per semester and earn your bachelor’s degree in paralegal sooner. How do online programs handle internships or practicum requirements? As an online paralegal student, you shoulder most of the responsibility of finding a firm where you can fulfill internship requirements. Each school has its own set of criteria, so find out whether the company for which you wish to intern meets your school’s requirements before beginning your internship. How will a paralegal degree help my career? A bachelor’s in paralegal signifies your ability to reason and think clearly, to perform legal research and present your findings in a concise and competent manner, and to organize and maintain legal data both in digital and hard copy form. These tasks are highly valued in reputable law firms and private and public companies, so having a paralegal bachelor’s degree can increase your chances of getting hired. 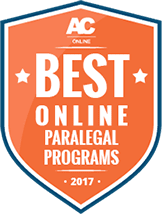 Is an online paralegal program less expensive than an on-campus program? As a rule, online programs charge lower tuition than their brick-and-mortar counterparts. However, even among online programs, tuition rates vary, so perform diligent research. Also remember that tuition is not the only cost you incur when pursuing your degree online. Some schools charge online students a technology fee per course, which can add up if you enroll full time. With the cost of a college education continuing its upward trend, tuition will factor heavily into anyone’s decision to pursue a degree. Prospective students may pay for their education through private and government student loans, grants, and scholarships. Although student loans have relatively lower interest rates, they still have to be reimbursed, unlike grants and scholarships (private or federal), which do not require repayment. Below are five scholarships for paralegal students. This scholarship awards $1,000 to the successful applicant and contributes an additional $500 to the recipient’s school. Applicants must submit a 500-word essay on how to avoid distracted driving. The award, made directly to the winner’s school, helps cover tuition and/or other school-related expenses. Applicants must have a minimum GPA of 3.25 and show proof of attendance or acceptance from an accredited U.S. institution. In addition to their resume and transcript, applicants must submit a one-page letter introducing themselves to the judging committee. If selected as a finalist for the scholarship, an applicant must schedule a Skype interview with the judges within 14 days of being notified or forfeit their eligibility for the scholarship. The scholarship amounts to $1,000. This scholarship opportunity worth $1,000 is open to students currently enrolled in or who have been accepted to a legal studies program at an accredited U.S. college or university (pre-law, paralegal, or juris doctor). Applicants must have at least a 3.0 GPA and submit a 500-word essay on a topic of their choosing. The essay must reflect the applicant’s creativity and intelligence and include relevant cited sources. Applicants must be enrolled in an undergraduate pre-law or paralegal program in an accredited college or university, or show proof of acceptance if not yet currently enrolled. Further, they must submit a transcript of records showing a minimum GPA of 3.0, complete Legal Scholarship Application (available at their website), and write a 650-word essay. Applicants must focus their application essay on their objectives for their legal career. The scholarship amount is $1,000. The National Federation of Paralegals administers this scholarship that awards scholarships to students who are working towards a certificate, associate or bachelor’s degree in paralegal studies. Students must be enrolled in an accredited U.S. university and have at least a 3.0 GPA. They must also submit a recommendation letter from the head of the program in which they are enrolled and a four-page essay describing pro-bono projects open to paralegal students.